Censorship is a obstacle for journalists in countries where the media is controlled by the government. For many this restriction limits freedom of speech, freedom of information and open dialogue. Because of these restrictions the full story of domestic workers in the Arabian Gulf is barely told, and they are ignored or silenced. The following article tells the story of how these “modern day slaves” are treated. The UN Declaration of Human Rights was adopted in December, 10, 1948. - Article 4: No one shall be held in slavery or servitude; slavery and the slave trade shall be prohibited in all their forms. - Article 5: No one shall be subjected to torture or to cruel, inhuman or degrading treatment or punishment. Migrant laborers, for those who were engaged in domestic jobs, are considered a necessity in the censorship restricted Arabian Gulf countries. Their countries of origin profit highly from these workers endowments and favor their migration. Recently, more than 10 million migrant workers from Southeast Asia, South Asia, and Africa live and work in the host Arabian Gulf countries. However, it is apparent that most of these migrant workers are frequently victims of financial, physical, and sexual exploitation by their employers, which often reduces their sense of self-esteem. Because women have been absent from their children, families can be effected psychologically, mentally, and emotionally. These domestic workers employed in the Arab states, are treated as what they call “modern day slaves” who undergo sexual abuse, harassment, and 21-hour long workdays. For thousands of domestic workers in the gulf “being a maid doesn’t just mean mopping the floors” — Alya Mooro, on Broadly Vice. Rothna Begum, a writer for the Huffington Post interviewed a few women for International Migrants Day. One of the stories depicted is from a Ugandan domestic worker called Maria, who was misled into believing she would earn a good salary at a mall in Dubai, but the reality was it was a domestic worker position, where she was paid half the money she was promised, and was overworked with no days off, beaten, and not well fed. After she fled to the Ugandan Embassy, they offered her a visit to the immigration department, but they did not provide safe shelter. Maria is only one of too many domestic workers being abused in the Gulf. While many of these countries experimented in banning the migration of domestic workers to the Gulf, unprincipled recruiters find separate and unregulated ways to send migrants desperate for jobs abroad. Many domestic workers complain that they are not paid, have long working hours with little to no rest, have their passports confiscated by their employer, and are confined to the household in which they work. A story that comes out of a Lebanese prison talks about a Sri Lankan migrant worker (identified here as H.R. ), who was interviewed by Sabah Haidar. In Sri Lanka, H.R. was living with her family in a poor and underprivileged town, and her father was very sick. H.R. started to look for work through an agency in her country of residence and accepted to travel to Lebanon. H.R. believed that with the money she earns working abroad, she will be able to cover her father’s medical expenses. Arriving to the Lebanese Airport, her employers picked her up and took her to their home in the mountains. H.R. was 18 years old at the time, and her employers where a 75 and 78 year old couple. Upon her arrival her passport along with her phone were confiscated. H.R. was badly treated, starved, over worked, confined to the house, and was forced to sleep on a cold kitchen floor in the freezing Lebanese mountains. The old couple had a garden, where H.R. was expected to pick fruits from the trees, but not allowed to take any, only allowed to eat the leftover food. Her employers also found it difficult to pronounce her name, and agreed to call her “Himara”, which she later found out meant “donkey” in the Arabic language. A year passed and on her 19th birthday, while cutting parsley, H.R.’s employer entered the kitchen. H.R. saw this as an opportunity to ask about her salary that she hasn’t been receiving for a year, and was eager to send money to her family. Her employer was outraged and started to hit H.R.’s head against the edge of the basin. In a fit of self-defense, H.R. used the knife she was cutting parsley with and stabbed her employer. After looking at the pool of blood, H.R. ran out the house, and asked somebody to help her, almost instantly confessing to the tragedy she had committed. H.R. has been imprisoned since 2008, and was convicted to life sentence. This real life account outlines the abuse many domestic workers face around the world, and their hopes of a better life for themselves and their family. While their cries ring against silent walls abroad, back home they feel the shame of their abuse whether physically, emotionally, or sexually. They were missing their family while away and now that they have returned they feel dishonorable, disgraced, and humiliated. “What do children want? For you to play with them and a hug. House workers just want ‘thank you’ and ‘please’.” Sabah Haidar, Salzburg 2018. 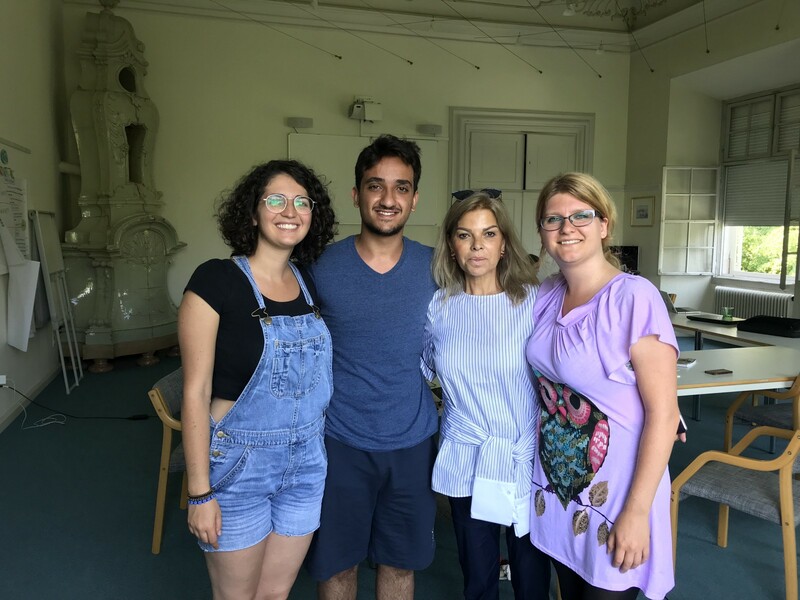 In an attempt to create a different and new approach to re-imagining journalism we wished to develop a new method for journalists working under censorship restrictions to help them tell a meaningful and important story. Children learn from their parents, from society, and from media; therefore, it is important to reach them and give them information so they grow up able to form their own opinions. Thus they are our target audience. We wanted the method we developed to not only tell the story but also educate families. 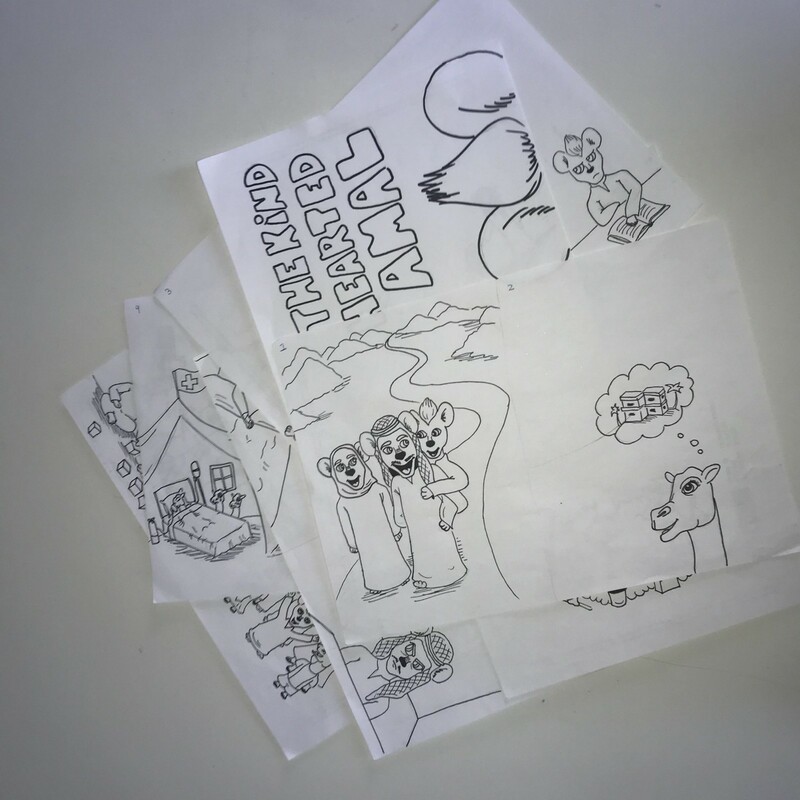 The idea was a children’s book: The Kind-Hearted Amal. 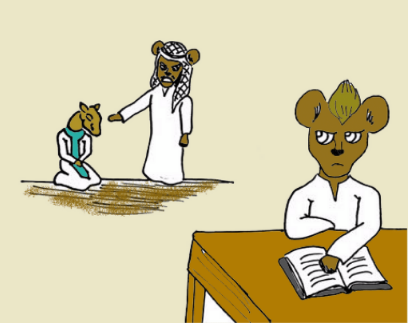 The story is about a young hyena who befriends the house keeper, a camel named Halima. The names mean ‘hope’ (Arabic) and ‘gentle and humane’ (Ethiopian) respectively. Throughout the story the reader will follow Amal as she shows compassion toward her friend, a compassion her parents later learn as well. The story ends with all of them (Halima and her children and Amal and her parents) having dinner together, having learned about their similarities, rather than seeing their differences. We chose to personalize animals to make the book less threatening in the media controlled countries. It also helped us to keep the innocence of a child. The idea is not only to tell the story and educate our target audience but children all over the world where similar problems exist. In countries such as Mexico, Denmark, and Lebanon domestic workers are a frequently used work force and although they are not treated as inhumanely as in the Gulf States it is still an unspoken issue. The lives of people in countries where media is censored, restricted, and controlled by the government are oppressed and people are distressed by the lack of censored media. Created at the Global Academy Salzburg, Austria 2018. The sketches for the book — all done by hand.